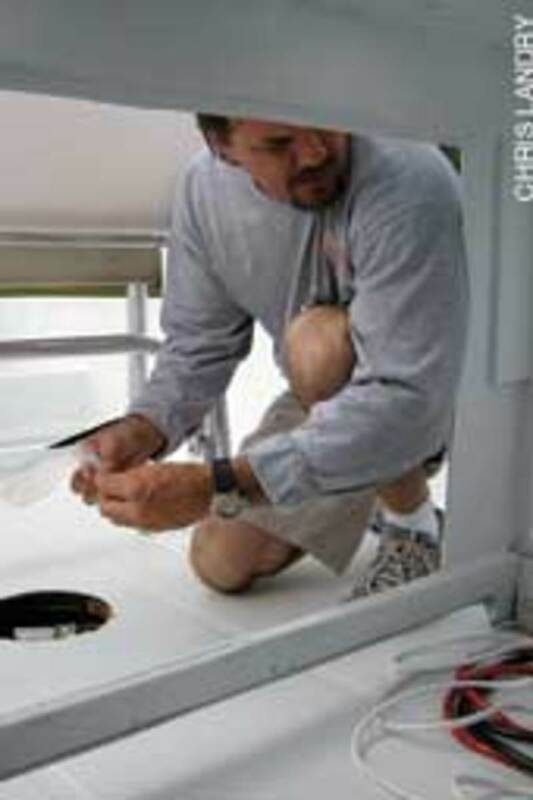 Hurricane Katrina had beaten up the old Boston Whaler pretty badly, though not enough to scare Jeff Koenke away. Despite its crushed port gunwale, a blistered bottom and a corroded aluminum fuel tank, the 1984 25-foot Outrage was perfect for Koenke, who first saw the boat on eBay. 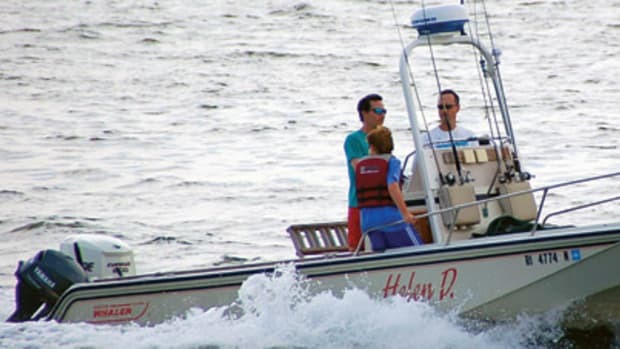 "I wanted a Whaler because they&apos;re unsinkable," says the 45-year-old Sarasota, Fla., resident. "I have two [6-year-old] boys, so that was important. 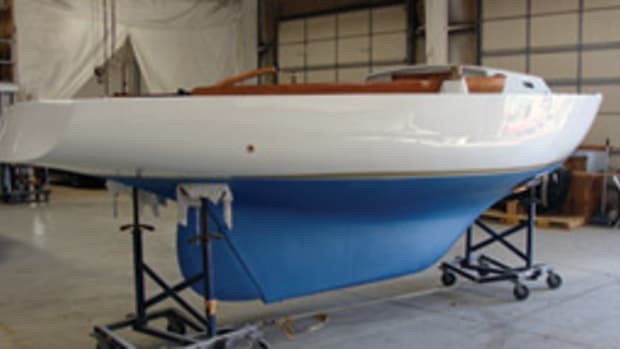 I like the look of the older hulls, and a newer 25 Outrage is $60,000 to $70,000." 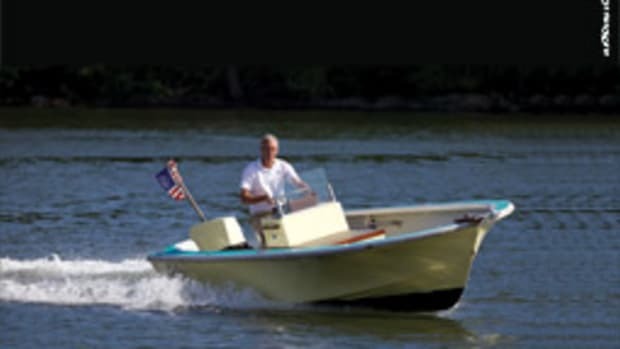 Indeed, a 2- or 3-year-old model will fetch about $70,000, and a 2011 Outrage 250 (base boat) with twin 150-hp 4-strokes retails for about $108,000 (www.bostonwhaler.com). So Koenke turned to the used-boat market to find a Whaler. Although the boat would cost less, buying used, refitting and repowering takes hard work and patience. Koenke was up to the task. He has spent 600 hours refurbishing his 27-year-old Outrage, and he will have invested about $30,000 when all is said and done. "I&apos;m a patient guy, so the outcome is going to be better than most newer boats," says Koenke, who bought the Whaler 2-1/2 years ago. "I&apos;ve taken my time and spent money here and there. But it&apos;s time-consuming, a long, drawn-out process. Probably by [the end of] spring it will be done if the funds are available." 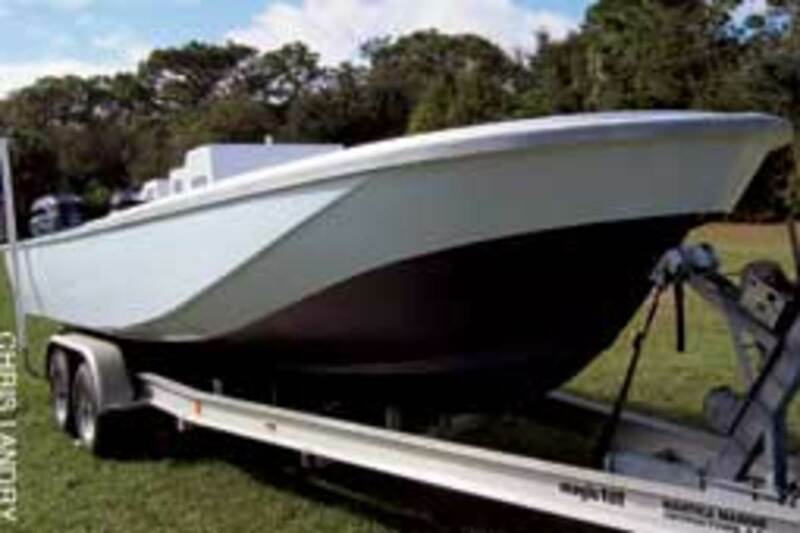 Koenke paid $3,500 for the boat and trailer. One of its twin Johnsons - circa 1980 - was still on the boat. The trailer and outboard were worthless. 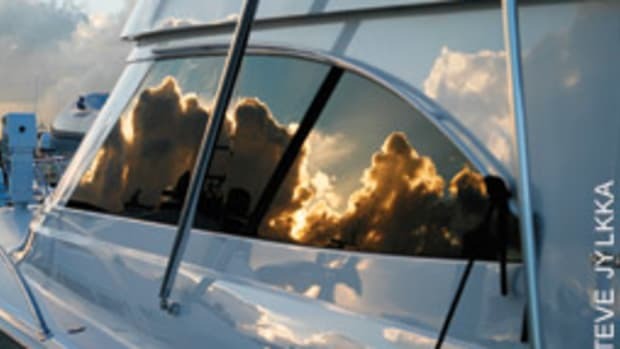 "The boat was originally from Louisiana," says Koenke, who previously refitted a 1987 Boston Whaler Revenge, a 27-foot walkaround. "It&apos;s a Hurricane Katrina boat. I believe it was under water for some time. It was in rough, rough shape." 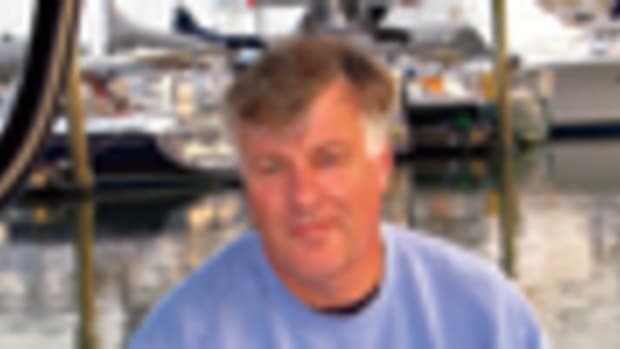 Koenke hired Robert Helmick - a local boatbuilder, designer and refit guru (www.tortugaboatworks.com) - to help him revive the boat. Koenke and Helmick had the bottom chemically peeled, then sanded it and let it dry out for about six months in Helmick&apos;s boat shed. "There was so much moisture trapped in the laminate," Helmick says. "I think it had been sitting in a marsh or fresh water. We actually drilled some holes in the keel, and some gross, dark fluid oozed out. There were areas of the hull with big blisters. We sanded down the whole bottom to just above the waterline. There was no gelcoat left." Damaged areas of the bottom were repaired with a vinylester fairing compound, Helmick says. After more sanding, they sealed the bottom with three epoxy barrier coats, followed by two coats of anti-fouling. The hull sides, decks and interior also were sanded and sealed with epoxy. Helmick sprayed the entire hull, decks and all interior areas with Awlgrip. The original non-skid was sanded away, and he sprayed on Awlgrip non-skid. The port gunwale received the worst punishment during the 2005 hurricane. A 4-foot section of the gunwale cap&apos;s inboard side was ripped off, exposing the foam beneath. Helmick rebuilt the area using 4-pound foam, fiberglass and structural filler. The starboard quarter was bad, too - as if someone had taken a bat to it. Helmick has this area looking new again. The pair replaced the Whaler&apos;s original cutout transom with a full-height transom. 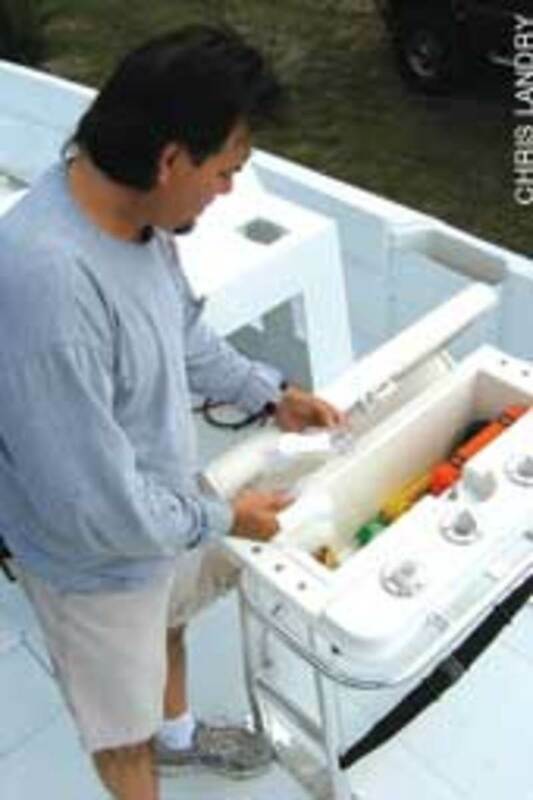 Helmick worked with Armstrong Nautical Products to engineer a custom aluminum outboard bracket. For Koenke, the toughest part of the job has been the sanding. 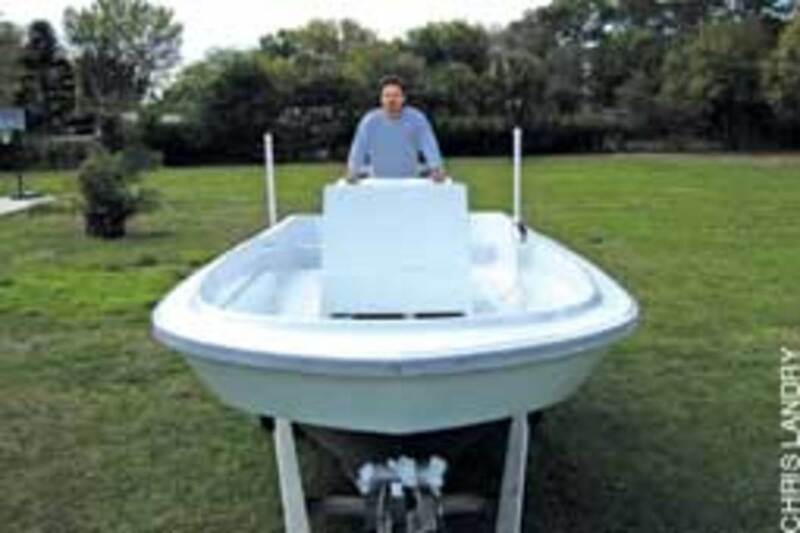 "I was fortunate enough to do a lot of the work myself and keep the boat at Robert&apos;s place in dry storage," he says. "If I had questions I could just reach over and ask him. I&apos;m a roofing contractor by trade, so manual labor doesn&apos;t bother me. I was ready to get my hands dirty. I just did the grunt work." There likely was a lot of grunting going on when the men replaced the foamed-in aluminum fuel tank. They used a reciprocating saw to cut through the foam, removed the corroded tank and installed a 100-gallon aluminum tank. They coated the bottom with epoxy and mounted it high enough so water will pass underneath en route to the bilge pumps. 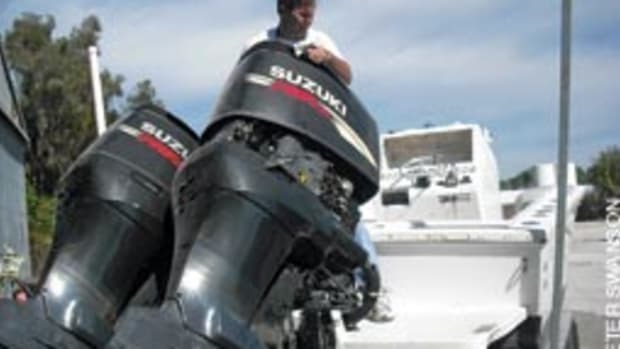 For power, Koenke bought a pair of 1999 150-hp Mercury OptiMax outboards - direct-injected 2-strokes - for $3,500 from Ocean High Performance Marine in Pompano Beach, Fla. "I pretty much bolted the motors on myself," Koenke says. "Robert gave me the tools to do it." 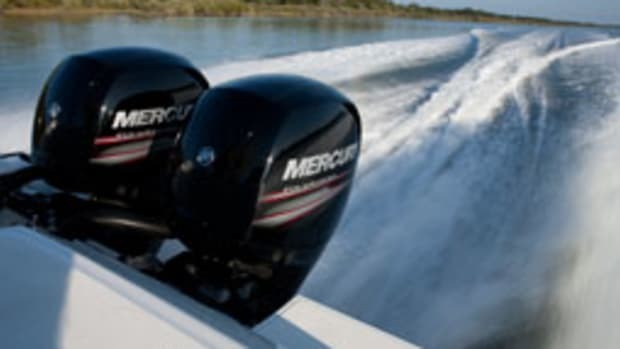 The 12-year-old Mercs have logged 800 hours, but the original owner took care of them, and the same mechanic serviced them through the years, Koenke says. He doesn&apos;t know the size of the Johnsons that previously powered the Outrage. "We&apos;re going to get the boat up and running and see if we need more horsepower," Koenke says. "We&apos;ll see how it rides. I might upgrade to twin 200s. I might have to throw some trim tabs on it, too." Koenke purchased a used twin-axle trailer for $1,200 and has spent about $2,000 replacing its major components, such as springs, bearings and tires. "I was really just looking for a good frame," he says. He scrapped the Whaler&apos;s aluminum-frame leaning post and replaced it with a new one that includes four rod holders and a seat with storage underneath. He kept the console, though just the fiberglass structure. He removed the original wooden side door on the console (the other one was gone) and plans to install StarBoard composite doors. The console&apos;s panel for gauges was taken off, as well. Koenke still had significant installation work to do when Soundings met up with him, but he&apos;s "in the homestretch," he says. "I have the steering. I have the helm, the throttles. I am picking up the harnesses and the oil canisters. ... I already ran all the battery cables. I have the fuel lines in and the fuel separators in. I have to fasten the bilge pumps and hook up the wires and shrink-wrap them. I have to figure out where [Helmick] wants me to mount the battery switches and the battery boxes." Sounds overwhelming. "You gotta have passion for this, and you have to be patient," says Koenke, whose wife, Lauren, is a dental hygienist. "I enjoy doing it. It&apos;s a hobby for me. It takes my mind off the daily grind." The anticipation of finishing the project drives him. When she&apos;s up and running, the Whaler will be used "strictly for pleasure - fishing and diving," he says. Koenke had little time to enjoy the first Whaler he refurbished. "I was pleased with the boat, but we had twins on the way," he says. "The house wasn&apos;t done getting remodeled. I was short on cash, so I had to let that one go. This one I&apos;m keeping. They can take my house before they&apos;ll take the boat."